Any smart survivor knows they shouldn't leave home with out a trusty bag for carrying supplies. Made of cotton canvas with faux leather trim in tonal reds, this themed messenger bag features a custom flannel barbwire lining. Complete with a padded laptop pocket that fits most 15-inch laptops, you'll feel prepared when you leave home with this bag. 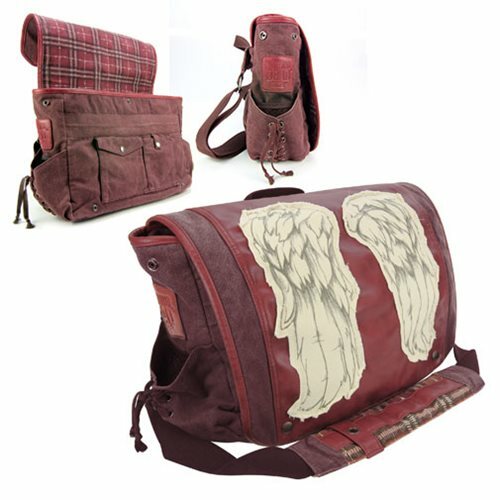 The Walking Dead Daryl Dixon Dead Red Wings Messenger Bag measures approximately 15 1/4-inches wide x 10 1/2-inches tall x 4 3/4-inches long. Ages 14 and up.